The latest Jar of Jam shirt is a light blue Recover Brand t-shirt with a skull on the front that includes WNCW inside the skull. "Wednesday Nights / WNCW-FM 88.7 is below the design. 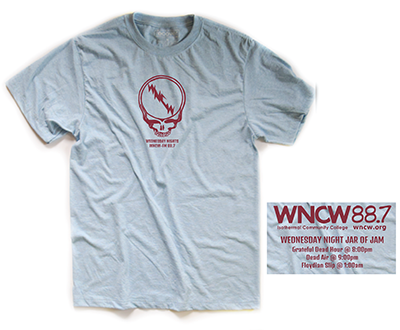 On the back, WNCW's logo is above the Wednesday Night Jar of Jam program listing including the Grateful Dead Hour, Dead Air, and Floydian Slip. The designs are imprinted deep red.